DSM Terminal Switches help to minimize network downtime by providing IT personnel with secure, reliable Out-of-Band Rescue™ access to console port functions on remote network devices. Terminal Switches Provide Secure Console Port Access ... From Anywhere! Network administrators know the drill. First, the network goes down. Then the calls start rolling in, asking when the network will be back up again. Usually, correcting the problem that caused the network crash is simple; the hard part is gaining access to a console port on the troublesome network device that caused the crash in the first place ... especially if that device is located at a remote site, miles away from your office. If your network includes a WTI Terminal Switch with out of band management capability, then the solution is simple; no traveling to remote sites, no expensive visits by your tech team and since you can fix the problem immediately, without leaving your office, fewer calls and emails from upset users who can't access their files. WTI offers a wide range of Terminal Switch products to fit the needs of most remote console management applications. In addition to our line of dedicated Console Server products, we also offer Console Access Server + Power Control Hybrid products, which provide both remote console port access and remote control of power switching and reboot functions. WTI Terminal Switch products allow you to use HTTPS to access command and configuration functions. This allows the Terminal Switch to create self signed security certificates without the need to go to an outside service, and eliminates the need to set up your domain name server to recognize the Terminal Switch. SSL security certificates and server private keys provide encryption and an additional authentication for a higher level of security during web based communication with the Terminal Server. The "Modem Hunt Telnet" and "Modem Hunt Raw" parameters allow WTI Terminal Servers to support modem pooling in conjunction with third party Serial Port Redirector software. This allows you to connect external modems to several Terminal Server serial ports, and then use the Terminal Server to automatically find a free modem when you need to create an outbound connection. Most Telnet clients will only allow four simultaneous Telnet connections, but with a WTI Terminal Switch, you can establish one simultaneous Telnet connection for each serial port. 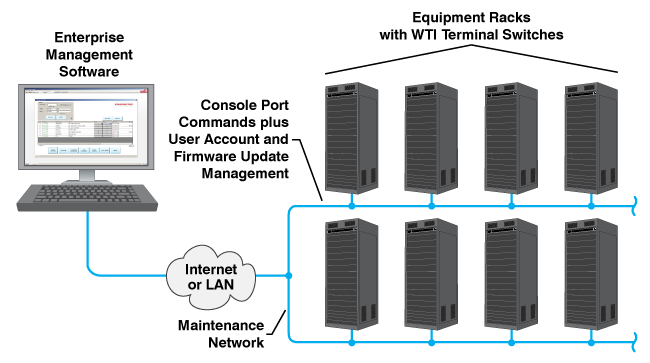 This means that on our 40-port Terminal Server units, you can establish up to 40 simultaneous Telnet connections. 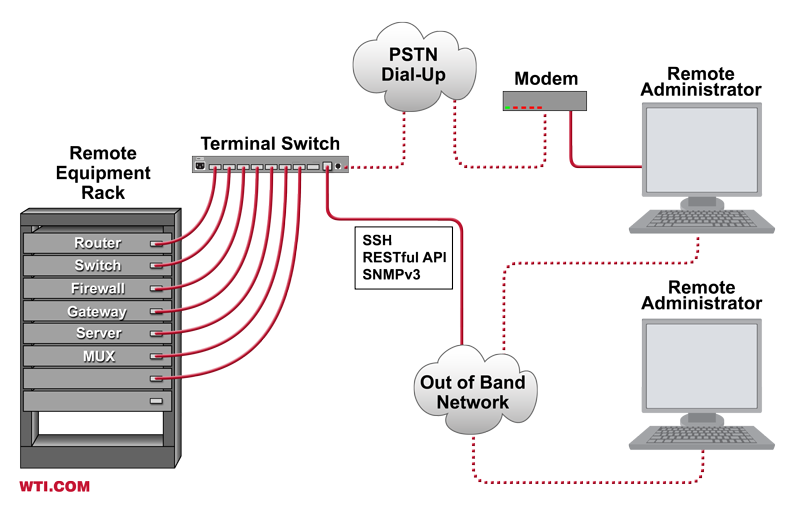 When normal in band communication is not available, WTI Terminal Switch products can provide a convenient means to create secure, encrypted, outbound SSH connections to network devices via dial up. Even when you can't establish a normal network connection with a remote network device, you can still dial into the Terminal Switch via modem and create outbound SSH connections to allow communication with devices on your secure local area network or intranet. If you need to communicate with a remote facility that doesn't have network access, such as an oil rig or remote equipment closet, the Terminal Switch allows you to establish a secure, encrypted connection via modem and then communicate with other devices at that location. All WTI Terminal Switch products include a convenient Device Management Utility that allows network administrators to manage multiple WTI Terminal Switch units from a single interface. The DMU Device Management Utility eliminates the need to individually access multiple WTI Terminal Switches in order to display unit status, update user names and passwords and delete user accounts on a series of units. The DMU also allows administrators to group WTI Terminal Switches into device groups, providing the ability to sort available units by functionality, unit type, location, department or other criteria. This simplifies management of multiple units by ensuring that similar units will all receive the same instructions. WTI Terminal Switch products feature SNMP compatibility and full MIB support, allowing network administrators to use managed MIB objects to select terminal switch configuration parameters, monitor terminal switch status and manage user accounts for the terminal switch. When any of the terminal switch alarm features are employed, SNMP traps can also be used to notify administrators when event alarms are generated and when user-defined critical conditions are detected. WTI Terminal Switch products feature a multi-level user directory, plus security and authentication functions that work together to provide an ideal solution for co-location applications. The user directory allows administrators to easily define separate command access and port access privileges for each user account; user accounts can be restricted to allow access to only a specific selection of serial ports, and command functions can also be limited to prevent access to higher level configuration functions. In addition, WTI Terminal Switch products also support LDAP, Kerberos, TACACS+ and RADIUS authentication protocol, plus SSHv2 encryption and IP address filtering to ensure that only authorized users are allowed to log in to command mode. WTI Terminal Switch products feature a comprehensive selection of alarm and notification features that allow network administrators to constantly monitor factors such as power conditions, rack temperature, ping command response and invalid access attempts at remote network equipment sites. All alarm functions can be individually configured to provide notification when specific, user-defined conditions are detected. If the WTI Terminal Switch detects an environmental event or operating condition that triggers a user-defined alarm, the Terminal Switch can immediately notify the appropriate personnel via email, text message, SNMP trap or SYSLOG message. This allows network administrators to respond quickly when critical conditions are detected and address significant network issues before they grow into bigger problems that could potentially interfere with network communication. In order to prepare for the upcoming switchover to IPv6 protocol, all WTI Terminal Switches now provide full support for both IPv4 and IPv6 (the intended successor to IPv4.) This helps to ensure that WTI Terminal Switches purchased today will be fully compatible with the planned IPv6 internet environment, and will not be rendered obsolete when the IPv6 protocol eventually becomes the new worldwide standard for network communications. All WTI Terminal Switches include WTI’s convenient Enterprise Management Software, which drastically simplifies the task of managing multiple Terminal Switches spread throughout your network infrastructure. The WMU Enterprise Management Software provides a centralized command interface that allows administrators to easily manage, label and control multiple WTI Terminal Switches in large network applications, reducing the time required to access console port command functions on connected devices. Once installed on your PC or laptop, the Enterprise Management Software can search a user-defined IP address range on your network and discover all compatible WTI devices within the range. Discovered devices are then added to the Enterprise Management Software’s inventory, allowing administrators to assign a descriptive tag to each Terminal Switch in order to denote the location or function of the device. In addition to providing a centralized interface for remote console access functions, the Enterprise Management Software can also be used to control firmware updates for WTI products and edit and manage user accounts at individual or multiple WTI devices.